Very comfortable historic home with lots of character inside and out. This home has original hardwood floors (most of them maple) throughout, high coved ceilings, beautiful wood burning fireplace, plus a pellet stove on the main level. 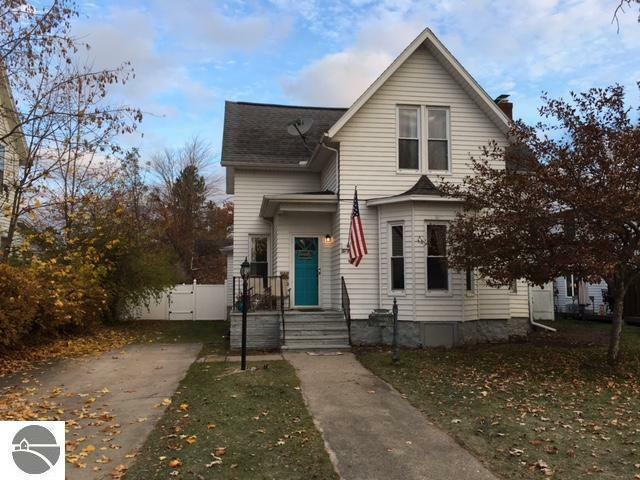 Many updates include all new light fixtures, fresh paint, main entry has new flooring, drywall, and fixtures, and back entry has new ceramic tile.The bath upstairs has been completely refinished with a claw foot tub, tile floor, fixtures, wainscoting and paint. All flooring upstairs has wood floors, new ceiling fans, paint and the hallway has some built in storage shelves. The back yard is surrounded by a new privacy fence, and has an old historic carriage house for storage plus the full basement for extra storage. You are just one block from downtown East Tawas for shopping, special events that take place all year round. Close to Tawas State dock, and Lake Huron.